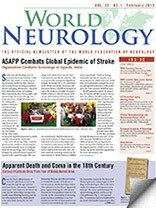 ASAPP Combats Global Epidemic of Stroke Stroke is the third leading cause of premature death and disability worldwide. The burden of stroke is growing in low and middle-income countries due to many factors including population growth and aging, urbanization, unhealthy diets, physical inactivity and smoking. 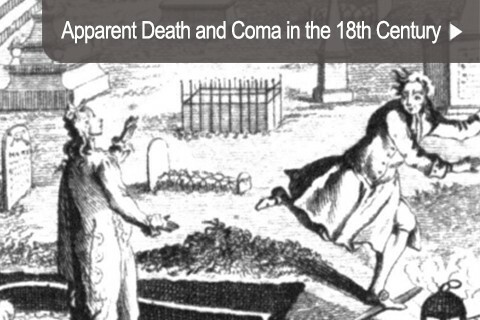 Apparent Death and Coma in the 18th Century Coma has been a phenomenon of interest for physicians as well as lay people through the ages and was associated chiefly with stroke (“apoplexy”) and trauma1. One chapter in the history of coma has two extraordinary perspectives, notably coma following drowning and the fear of being buried alive, which played a role particularly during the late 18th century. 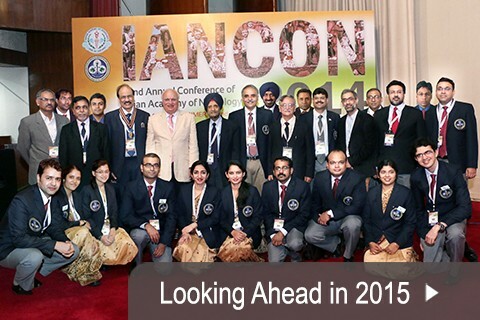 Looking Ahead in 2015 The year has passed so quickly, we have to evaluate our activities as well as plan our future. In 2014 the WFN faced many challenges and has come through some difficult times with renewed vigor in placing neurology in a better position. A neurology fellowship is offered by the Memory and Aging Center at the University of California, San Francisco, and the Neurology Department at Yale University (position can be filled at either location) through the NeuroHIV Cure Consortium, which operates numerous neurological research studies in acute HIV infection and cure strategies in Thailand and Africa. Eye Movement Disorders in Clinical Practice is written by a legend in the field of neuro-ophthalmology, Dr. Shirley H. Wray. The book is a wonderful compendium of the common and challenging disorders of ocular motility. The European Academy of Neurology (EAN) was founded on June 3, 2014, in Istanbul by joint efforts of the two parent societies at their (first and last) Joint Congress of European Neurology, the congress of the European Federation of Neurological Societies (EFNS) and the European Neurological Society (ENS)1. I am a young neurologist from India and have just finished my training. I have a keen interest in the field of cerebrovascular disease. It was possible for me to attend the World Stroke Congress in Istanbul in October 2014, due to the World Federation of Neurology Junior Travelling Fellowship. A large scientific event was held by the Scientific Research Institute of Children’s Infections of Federal Medical-Biological Agency of Russia this November. Clinical Neurophysiology and Neurorehabilitation 2014 (November 25-26) took place in Mosckovskye Vorota Congress Center in St. Petersburg. The Journal of the Neurological Sciences (JNS) is a broad-based journal that publishes articles from a wide spectrum of disciplines, ranging from basic neuroscience to clinical cases. These are thrilling times in neurological research. The field of neurology is now well beyond being just a great clinical specialty with a logical approach to a varied spectrum of interesting disorders. The year has passed so quickly, we have to evaluate our activities as well as plan our future. In 2014 the WFN faced many challenges and has come through some difficult times with renewed vigor in placing neurology in a better position. The Neurosonology Research Group (NSRG) WFN is dedicated to the promotion of science and research as well of education and training in the field of ultrasonic techniques and its clinical utilization. Therefore, international cooperation and the dissemination of scientific information within the field of neurosciences and neurosonology is part of NSRG WFN activities. Coma has been a phenomenon of interest for physicians as well as lay people through the ages and was associated chiefly with stroke (“apoplexy”) and trauma1. One chapter in the history of coma has two extraordinary perspectives, notably coma following drowning and the fear of being buried alive, which played a role particularly during the late 18th century. Stroke is the third leading cause of premature death and disability worldwide. 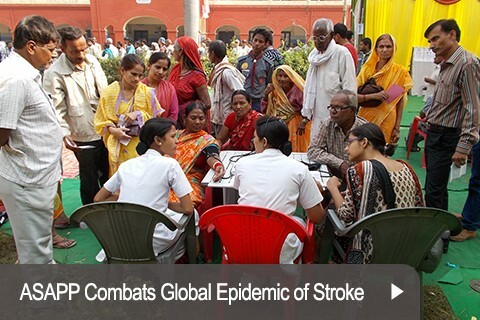 The burden of stroke is growing in low and middle-income countries due to many factors including population growth and aging, urbanization, unhealthy diets, physical inactivity and smoking.